Jan Estep, "Bad Lands: When canyoneering teaches you something about yourself," in Badlands: Photographs, Andrew Schroeder, MIEL Publishing, Belgium, December 2015, np [5-10]. Andrew Schroeder, Badlands Structure - Near Badlands National Park, 2008.
called Spooky and Peekaboo lie partway down Hole in the Rock Road just outside Escalante, Utah. I recently hiked them with a friend, driving the graded dirt road out to the trailhead and then following a steep trail down into the sandy wash where they begin. The way down to the wash is relatively open, passing first through sagebrush desert, then over sloped, exposed redrock. But once you enter into the slot canyons, the walls quickly rise up and narrow, blocking out more and more light as you proceed. In some sections the body can barely squeeze through the gap, as knees and elbows scrape against the gritty sandstone. Moving slowly, eyes adjusting to the dark, you can’t see your footing and have to feel your way along the rock. Out the other side, however, the world opens up again: bright, spacious, and free. Since the trip I’ve been bringing these images to mind whenever I get too caught up in a situation that causes me stress: a conflict with someone at work, an argument with a friend, or a painful memory from the past that wants attention. Each time that occurs: taking something too personally, feeling the hurt and irritation, wanting whatever it is to be different than it is, it feels like the world constricts down into a tiny sliver of itself. My perspective narrows and all I can see is the few inches in front of me, boxing me into a tight, limited space. In this state, it feels as if this is all I am, that this is all the world is: this problem, this feeling, this aversion and discomfort with my own experience. I can feel pretty isolated and afraid, caught in that canyon without a clear sense of when it will open up again. But when I manage to let go and release the constriction, the mind and heart naturally gravitate to a more spacious place, and I realize that the narrows exist within a larger landscape. Walking Utah’s topography gives me an embodied way to understand my emotional experience. Like the body in space, the heart wants to move; it doesn’t want to cling to things or fix itself into hardened positions. Yet, at any given moment if something comes along that triggers a strong reaction, I may be trapped by the narrowness of my view. I may get stuck, jammed in by a huge chockstone blocking the path. Unable to figure out how to climb around or over it, I can stay in there for days, causing lots of extra suffering for myself and others. At the scariest moments I worry that the darkness will never lift and I’ll be caught like this forever. This is what it can feel like: When I stumble into a metaphorical crevasse the world closes in. But if I manage to navigate the experience toward open awareness and accept the natural terrain—the constantly changing flow of thoughts and feelings, the rising and falling away of experience, the realization that nothing is permanent—then my perspective shifts and I’m free to move again. …That is, until the next canyon draws me in, and the cycle begins once more. The landscape continually shifts from more open to more closed-in areas. Spooky and Peekaboo are part of Grand Staircase-Escalante National Monument, a high-desert plateau of sedimentary rock that is speckled with geological forms caused by extensive erosion: slots, arches, pinnacles, hoodoos. 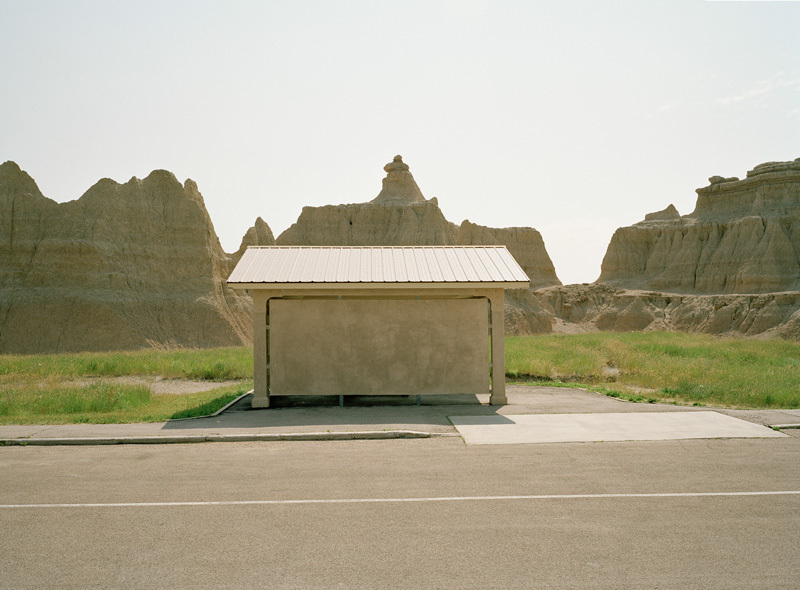 Another stretch of heavily eroded land occurs a thousand miles north and east in the South Dakota Badlands. The name reflects the assessment of those who first made a home here or traveled its surface in search of colonialist opportunity. The Lakota called this place mako sica meaning “land bad,” nineteenth-century French trappers called it les mauvaises terres à traverser—“the bad lands to cross,” and the Spanish called it tierra baldfa or “waste land.” Surrounded by the largest protected mixed-grass prairie in the United States, the Badlands rise up in a bizarre collection of colorful spires, contorted mounds, sharp ridges, and flattop buttes. With little vegetation keeping the soft sandstone in place, deep gullies cut into the rock. The formations are in stark contrast to the gentle, relatively flat sweep of prairie grassland. 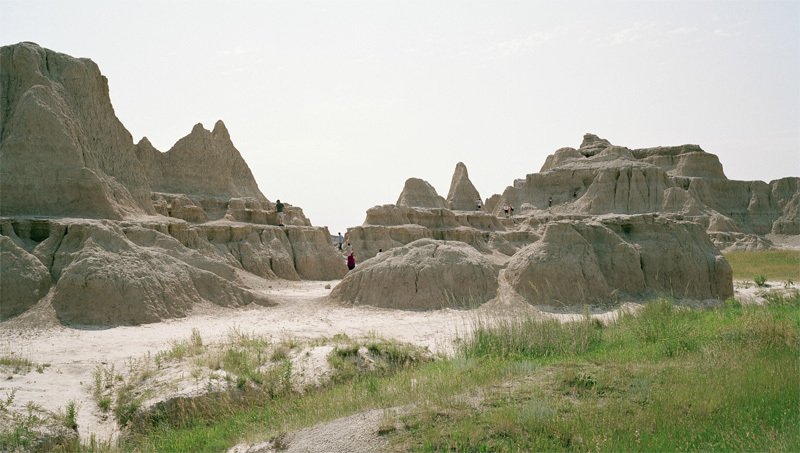 Andrew Schroeder, Badlands Crowds - Near Badlands National Park, SD, 2008. From the drive-to overlooks along the scenic byway that winds through the park, Badlands resembles the sweeping open expanse of the Grand Canyon, but in a softer, muted palette. The eyes and mind seem to extend forever in all directions. From the distant perch it’s hard to get a sense of scale, but once you hike down into the formations they easily swallow you up. Standing in the middle of walls rising high all around you, knowing you can’t get any purchase on the crumbly soil, if you back yourself into a gully, the only way out better not be blocked by local bison or bighorn sheep. The rugged topography, so picturesque from afar, can quickly disorient you. It’s hard to get your bearing when the long-view is obstructed. Again, the parallel with emotional experience is clear: without that larger perspective, you can be lost in the maze for a very long time. Slot canyons and badlands are integral parts of the environment. They arise naturally, shaped by weather, gravity, time. A person encounters them simply by moving through the desert or prairie. By analogy, because I am human and have a strong sense of self, my world will naturally and repeatedly narrow. The ego has learned how to defend itself from anything that causes pain or threatens its worldview. Each time that happens we enter a patch of badlands that can be terribly difficult to cross. Yet like any trained canyoneer we can learn the skills we need to navigate the daunting landscape: We can study the environment and understand its native geology. We can cultivate our tolerance for fear and grow more comfortable with the dark. We can move into these canyons with much more conscious awareness.